Discussion in 'Missing 1980 to 1989' started by Scorpio, Sep 30, 2016. Anderson was last seen on August 4, 1981 at the law office where she worked on East Manhattan Boulevard in Toledo, Ohio. The law partners arrived back at the office after a meeting at noon to find the radio on and their desks prepared for the day. Anderson left her romance novel open on her desk to the only violent scene in the book, where the herione in abducted at knife point. There was no sign of her elsewhere in the building and no signs of struggle. Her purse and keys were missing, but her car was locked in the parking lot outside of the office. She always kept the doors to the office locked and a buzzer had been installed at her desk to alert the shop next door in case of trouble. This was due to strange and harrassing phone calls she had been personally receiving. She disappeared without a trace, there were no sign of a struggle. Her purse and car keys were gone. Her car remained outside. The doors were locked. Akoya and spike like this. Anderson was employed as a legal secretary at the law offices of James Rabbit and Jay Feldstein on east Manhattan Boulevard in Toledo, Ohio in 1981. She was last seen at the business on August 4 of that year. Her employers discovered that the radio was turned on and their desks were prepared for the day upon their arrival at work. Unclaimed mail had been placed inside the front door handle and a romance novel Anderson was reading was opened on her desk. There was no sign of her elsewhere in the building. Her purse and car keys were missing, but her vehicle was locked in the parking lot outside of the office. She didn't leave a note on the door, which was her usual habit whenever she had to step out of the office during work hours. Anderson has never been seen again. She left a substantial amount of money behind in her bank account, and her Social Security number has not been used since her disappearance. Anderson had received suspicious phone calls at work in the weeks prior to her disappearance which seemed to disturb her. Her family reported that she also suffered from recurring nightmares about being attacked by a man. Anderson's employers installed an emergency buzzer at her desk during the summer of 1981. She also kept the office's doors locked at all times. This was due to the harrassing calls and omnimous messages. There have been several suspects in Anderson's disappearance, none of which have been officially ruled out in her case by investigators. Anthony and Nathaniel Cook, two brothers convicted of nine murders in the Ohio area between them in the 1980s, have denied any involvement in Anderson's case. Another convicted murderer currently imprisoned in Ohio is thought to have possibly been involved in her disappearance as well, though any connection has never been established and the man has never been publicly identified. Convicted drug dealer Jose Rodriguez Jr. and his attorney, Richard Neller, are also suspects in Anderson's case. Neller worked with Anderson's law firm during 1981 and authorities theorize that she may have overheard conversations between Neller and Rodriguez concerning drug deals prior to her disappearance. Investigators believe the information may have led to Anderson's possible abduction and/or murder, though this has never been proven. An informant testified at Rodriguez's trial in 1995 that Rodriguez confessed to killing Anderson, but the testimony was ruled to be unreliable. Both Rodriguez and Neller are currently imprisoned due to drug convictions. No one has been charged in connection with Anderson's disappearance. Anderson is described as a devout Christian fundamentalist who enjoyed her job and family life in 1981. She had a boyfriend and many friends. Anderson was planning to quit her secretarial job two weeks after her disappearance in order to attend Bible college. Her family has stated it would be extremely uncharacteristic of her to vanish without explanation for her loved ones. Anderson's parents are both deceased; her mother died of cancer in 1983 and her father died in 2008. In her father's obituary, it was noted that Anderson preceded him in death. Her case remains unsolved. "One morning while I was getting ready for work, I overheard Cindy talking to my mother. I do believe that the dreams could've been a premonition of fears that Cindy actually had in her subconscious at the time." On August 4, 1981, Cindy went to work as usual. She was employed as a legal secretary and, in the mornings, usually worked in the office alone. She kept the door locked at all times. A buzzer had even been installed at her desk so that she could alert the shop next door if there was trouble. "Jay and I came back from downtown, got to the door and the lights were on, the door was locked. We unlocked the door, went inside, yelled for Cindy and there was no answer. I started to look around out front. Cindy, when she would leave, would place the phones on hold and that wasn't done either." "It wasn't until really looking at the book, particularly reading the passage in the novel, that I had a sickening feeling that something was wrong." Cindy was never seen again. There was no body, no farewell letter, no hint where she had gone, or why she had disappeared. Were Cindy's dreams premonitions of a terrible fate? Or, were they just a coincidence? "She was a very quiet, obedient type of a girl. She never made waves with either myself or her mother. And she had lots of friends. She was the type of daughter that you just enjoy, I mean, just a beautiful young girl." "At the time of Cindy's disappearance, there were no circumstances in her life that any of us were aware of that would've caused her to have run away. She was looking forward to quitting her job in two weeks and going to a Bible college that she would attend with her boyfriend. She was very excited about it." "Just before she disappeared however, she was becoming like a debutante. She was spending a lot of time on her face and herself and she'd skip breakfast for this reason. And that may be part of the problem." "Her car was parked in front of the law office. Her bank account, which had a nice substantial amount of money, was never touched. Her social security number has never shown up under any other work place. It's a complete mystery how and why Cindy disappeared." "The day before Cynthia Anderson disappeared, I had been in the law offices to pay off a legal fee. She got a phone call. She kind of reacted like maybe it was obscene or something and hung up real quick. And the look on her face, still, I can picture it today. She was scared. She was honestly and sincerely scared. It gives me shivers to think of the look on her face. I went home and I called the police department and asked them to do a drive-by and check on her. Something scared the hell out of her, in my opinion." "She said that she was scared and she was talking in low whispers. She kept saying she had to go. I kept begging her to stay on the line, give me more information, give me an exact address, something that we could act on. A short while later, she again called. The lady mentioned that there were two houses side by side owned by the same family, and that the family was out of town. But their son was home and he was the party that was holding Cindy in the basement. We did check street after street on the north end to see if we could find two houses side by side. There's many, but you can't find any positive location to the house." "If she herself is out there, we want her to know we love her and we certainly want her to come back, whatever the case may be. The door is open, we certainly want anybody and everybody that can possibly help in this situation to do so." After Cindy's disappearance, a local grand jury indicted nine people for drug trafficking. Some suspect that Cindy knew one of them, and she was killed after she overheard incriminating comments. No charges were ever filed. The plaza on Manhattan Blvd. in Toledo, OH where Cindy Anderson worked. In 2008, Michael Anderson died without knowing what happened to his daughter. He lived 28 years without so much as a solid clue to where she might be. He managed to believe, for all those years, that someday she would call and say she had amnesia but was OK.
Cynthia Anderson was 20 when she vanished -- 30 years ago on Aug. 4, 1981 -- from the East Manhattan Boulevard law office where she worked as a legal secretary. Police, almost immediately, began investigating with the notion that foul play was involved. A body was never found, and charges were never filed. The case has gone cold. "Every so often new information comes in and we follow up on it," Toledo police Chief Mike Navarre said. Chief Navarre was in his fourth year with the department when Miss Anderson went missing. Patrols were given photos of the woman that some kept in the cruisers, but Miss Anderson disappeared during a particularly violent time in the city. Police were investigating serial killers and a number of other gruesome homicides. That's not to say the case went unnoticed. Less than a year after her disappearance, a case file with information was "so thick it takes two hands to pick it up," according to a June, 1982, Blade article. It probably started as any muggy, late summer day would have. Miss Anderson, after skipping breakfast, left her parents' Bedford Township home about 8:30 that morning in her white 1980 Chevrolet Citation. She wore a white V-neck dress with red piping, open-toe sandals, a sapphire ring, a gold watch, and carried a brown purse. She only had 10 days left at the office before she was to start college classes. People reported to police that they saw Miss Anderson as late as 9:45 a.m., but people calling the law office told attorneys they tried calling, without response, about 10 a.m.
A swing set overgrown by weeds remains in the backyard of her family's home. When attorney James Rabbit went to work that morning, he found the office empty. Miss Anderson's car was parked outside, but her purse and keys were gone. She didn't leave a note on the door, which was her usual practice, and the book she was reading, a romance novel, was left open. Old reports say the book was turned to a page about the violent abduction of the main character. "You knew right away something was wrong," Mr. Rabbit told The Blade in 2001. "You knew she wasn't coming back." Jay Feldstein, a Toledo labor attorney, was an associate at the firm when Miss Anderson went missing. In fact, the day she disappeared, Mr. Feldstein spent the morning in court with Mr. Anderson and one of his sons. "We didn't know what to think [about her disappearance]," Mr. Feldstein said. "Obviously we felt very sorry for the family for what was a tragic event." When Mr. Anderson died in January, 2008, he was still living at the home Miss Anderson grew up in, 3030 Springbrook Drive. He never changed his phone number -- what if she was trying to get back home. If he left, she would never find her family. 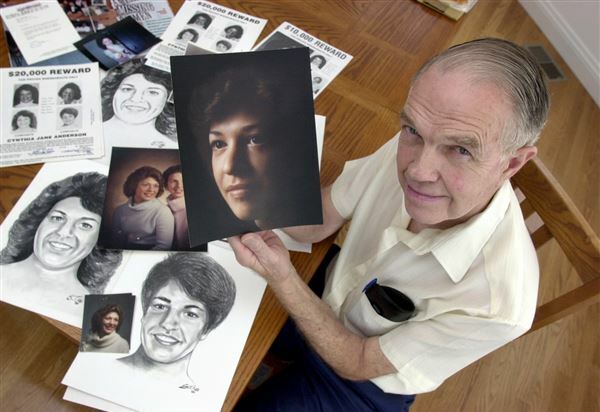 The father of four buried two wives -- Miss Anderson's mother died of cancer in 1983, neighbor Louann Hayward said. Behind the Anderson home is a small playhouse and a swing set where the children used to play. 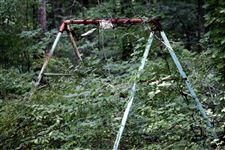 The play sets are worn from years of idle sitting. The paint has chipped off of the playhouse and the swing set is partially hidden by tall grass. 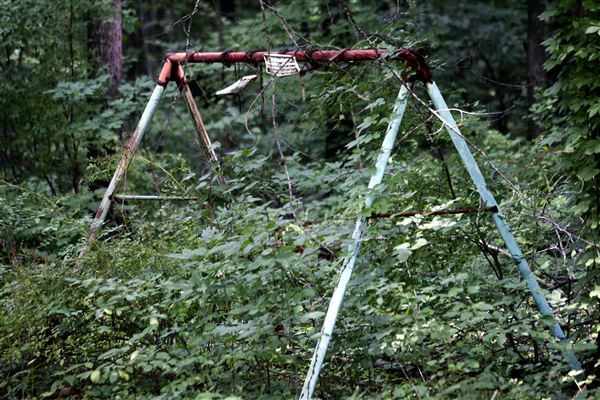 The posts are rusted and the swings are wrapped around the top bar. "He had lots of faith," Mrs. Hayward said. "He wasn't one to give up." Mrs. Hayward said that, when Mr. Anderson went out to search for his daughter that she would go to the family's home and keep Mrs. Anderson and her children company. She hasn't spoken to the Anderson family in years and most of the other neighbors have moved away. No one really talks about it anymore. Details of Aug. 4, 1981, are hard to remember, but Mrs. Hayward, whose children played with the Andersons, said the young woman was attractive -- maybe she caught the attention of a passer-by. Without a body, it's impossible to know what happened to the young woman. Mr. Anderson was also preceded in death by his daughter Cynthia Anderson, according to the father's obituary. Contact Taylor Dungjen at: tdungjen@theblade.com or 419-724-6054. Akoya, spike and Paradise like this. Cnythia's case is discussed at the 1:40 minute mark. Find Missing Cynthia Jane Anderson!